On February 23, 2019, Alexandria City Council approved an application submitted by Trammell Crow Residential to allow the long-anticipated redevelopment of the WMATA Bus Barn located at 600 N. Royal Street. Walsh Colucci land use attorneys Cathy Puskar and Bob Brant guided the Development Special Use Permit application through the development review process, coordinating with the development team, negotiating with City staff, and conducting significant community outreach. The approval will allow the development of a 287 unit multifamily building located in the heart of Old Town North. Cathy and Bob worked closely with the project design team and staff to ensure that the building is in alignment with the recently adopted Old Town North Small Area Plan (SAP) and the Old Town North Urban Design Standards and Guidelines, ultimately receiving the endorsement of the City’s Urban Design Advisory Committee. 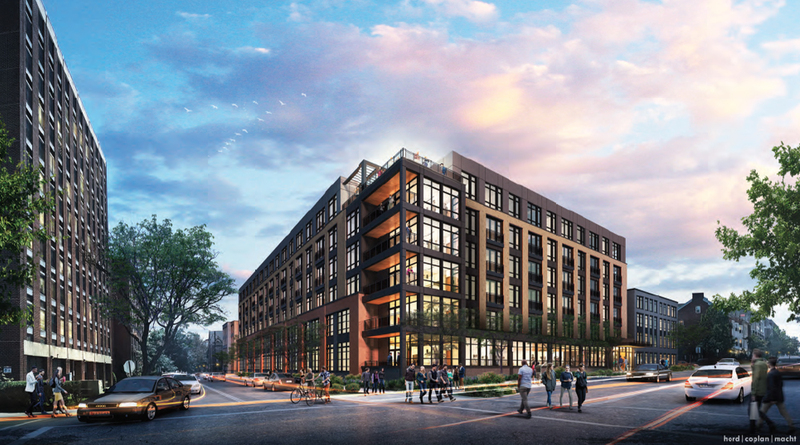 The development will replace the aging industrial Bus Barn and surface parking lot with a vibrant residential building that is compatible with the surrounding neighborhood and consistent with the vision of the SAP. The project will provide a number of benefits to the City, including the provision of twelve on-site affordable dwelling units, monetary contributions to the City’s Housing Trust Fund and Old Town North Streetscape and Open Space Fund, streetscape improvements and the implementation of “Green Streets” as recommended by the SAP, and the addition of at-grade open space. This approval represents the culmination of nearly five years of community-driven planning for the Bus Barn, and is yet another step towards the transformation of Old Town North.